The third in our series of linked scenarios following 6th Airborne on D-Day took us south of Varaville to Robehomme. Two of the primary tasks of 1st Canadian Parachute Battalion were to blow the bridges at Varaville and Robehomme. 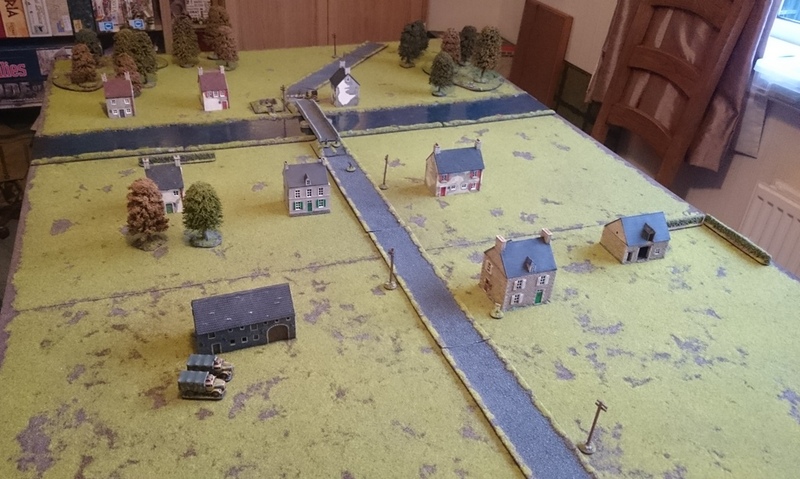 This scenario (#4 in Red Devils in the Night – we didn’t play scenario #3 as looked fairly unplayable in it’s presented form) looks at the action to blow the bridge over the river Dives at Robehomme by elements of ‘B’ Company, 1st Batt. 1st Canadian Parachute Regiment. The story of what happened at Robehomme Bridge can be read here. In this scenario, 2 squads of Paras (each with a Bren Gun, plus a mix of rifles and Stens) and a squad of Engineers (a Bren Gun, with the rest of the squad all with Stens) are attempting to capture and destroy Robehomme bridge. They have the explosives, but no fusing wire or detonators. These are held by Major Fuller (Senior Leader), who is somewhere in the town. The Major has to link up with the Engineers, and then the Engineers have to blow the bridge. Defending the bridge are 4 squads of Garrison Troops (rated Green for this scenario), armed with MP-40s and Rifles. 1 squad is on sentry duty at the bridge (this includes the garrisons’ only MG42) and the other 3 are sleeping in the Garrison billet – the large building in the town. The Town Commandant is also in the billet. The action (according to the scenario) takes place at 03:00 on 6th June, so night rules are in effect. Also, many of the troops are asleep, so the German player has limited Command Dice at the start of the game (we decided that this should be a single dice, as one German squad is awake at the start of the game). The British have a single Jump Off Point, being the road at the top of the table. Major Fuller has placed randomly on the board – ending up about as far away from the bridge as he could have been. Major Fuller, at the far end of town. Finally we determined Force Morale. The Paras had a Force Morale of 10,the Germans 8. The Game began with the first squad of Paras deploying on the edge of the table. As the Paras advanced, the Sentries on the bridge continued their conversation, blissfully unaware of what was approaching in the dark. We made an error at this point. We were sorting out the Close Assault from the QRS, rather than the rules, and the QRS is missing the vital piece of information about a unit in close combat being overwhelmed if it has over 4x it’s dice against it. The Assault should not have taken place – however, we messed up and the Sentries were killed, but managed to kill a single Para in the process. The second squad attempted to close the gap to the MG42, but several members lost their footing in the dark, and the squad’s assault faltered – Dave managed to roll a movement of 5″ on 3D6 – this would prove costly, as we shall see. The Germans were trying to bring their MG42 to bear on the attacking Paras, but surprise and fear slowed their efforts and they were suddenly overwhelmed. The Germans were killed to the man, but did not die quietly: 3 Paras were gunned down as the overran the Gun Pit. Three Paras were killed, and the Squad Leader seriously wounded. The remaining Paras dragged their Corporal to cover, not realising that they ran from a single remaining German. Having a Junior Leader wounded, the Paras lost a point of Force Morale. Though faultlessly brave, the German Squad Leader’s life was not charmed, and he died under a hail of bullet from the second Para squad as they exacted sweet revenge for their fallen comrades. The German Force Morale was reduced by a further point for the death of the Junior Leader. Meanwhile, awoken by the sounds of combat, the rest of the garrison rush from their beds, trying to form some kind of defence. The second Para Squad, leaving the Engineers on the bridge, formed up in a defensive position to give covering fire. The German fire caused the Paras to duck for cover (inflicting shock) thus distracting them from their task of laying charges. The fighting seemed to last an age. Though under constant rifle fire (which was proving merely troubling, rather than deadly) the Paras pumped magazine after magazine of bullets into the buildings, rapid firing their rifles and emptying Bren magazines by the bucket. The Squad had Routed, reducing the German Force Morale to 2. The Battle continued, with German casualties mounting. However, it wasn’t all one way traffic – The Bren Team of the Engineers were killed, effectively removing that squad from them battle, as their Stens were out of range of the German positions. Then, as Major Fuller moved forward to encourage his troops for one final effort, a stray bullet found it’s mark and he fell dead. Seeing the Major killed stunned the Paras to their core. – Dave rolled a ‘6’ on the Force Morale table for the loss of their Senior Leader, and they lost 3 points of FM! Most of the squad died, and with the Sergeant seriously wounded, his remaining squad member carried him to safety. The Force Morale of the German Garrison was reduced to zero, and they withdrew. With the battle over, the Engineers had plenty of time to rig the bridge, and blew it to kingdom come. Phew! What a hard fought battle this was! I don’t think either side did much wrong, although Dave would argue that the one thing it did prove is that Close Assault, even with far superior troops (i.e. Elite Aggressive vs Green), can be a deadly affair for both sides, and that it almost cost him the game – certainly the point where I caught his squad in the rear after they overran the MG42 was one of my highlights. Afterwards, Dave did complain that he thought his troops would have known they were there, but since Dave actually saw me place the models in the building at the start of the game, I must admit that I wasn’t overly sympathetic – he simply forgot about them in the heat of battle. The game turned when the engineers attempted to set the charges first time around. Dave was very tempted to move towards my squad in the open, and hit them with 34 dice of fire, but ultimately decided to try and achieve his objective instead and blow the bridge. I thought the game was up at this point, when I glanced over and saw that I had a full CoC dice – I interrupted the phase, and managed to inflict shock on the engineers – he would have to start again to rig the charges. At this point, Dave gave up on blowing the bridge, and decided to try and clear the buildings instead. What followed was a very long firefight – probably lasting 90+ minutes actual play, and we rolled countless dice when firing at each other. In the end, the quality of the Paras won through. Since they were facing Green troops, they were hitting on 4,5 or 6, whilst in return, the Germans needed 6s to hit. Since the Germans also lacked and LMGs, the sheer weight of fie, and hit probability, eventually took it’s toll. *A note on the scenario itself. Its clear from reading the account of this battle, that Major Fuller was with a force of Paras, and it was the Engineers who didn’t arrive initially to blow the Robehomme bridge. Also, I was wondering what cover (walls, hedges, fences) were around the buildings in the scenario (these tables are very open, compared to what we usually fight over), so I visited the Robehomme bridge on Google Maps…only to discover that the bridge is pretty much in the middle of nowhere – Robehomme is several hundred yards away, and there are certainly no buildings within the vicinity of the bridge. However, the Varaville Bridge over the River Divette was also an objective of the 1st Canadian, and this indeed has houses along the banks on both sides of the river, so I am left wondering if the scenario writers either picked the wrong bridge (either by accident, or design), or simply decided to use a massive dose of artistic licence to produce the scenario that they did. What a fabulous AAR. This campaign is really heating up and I think all the work you have put into the terrain is paying dividends too!